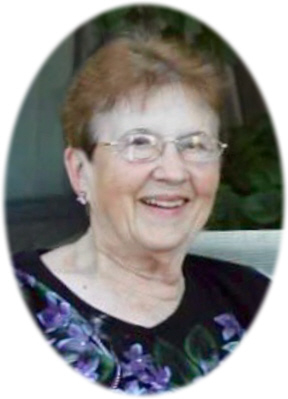 Donna June Crumbaugh, 88, of Ashley, MI, passed away Tuesday, April 9, 2019, at her home, surrounded by her family. Funeral Services will be held at Smith Family Funeral Homes Ithaca, MI, on Saturday, April 13, 2019 at 10:30 A.M., with Pastor George Showers and Pastor Zella Daniel officiating. Burial will take place at North Star Cemetery, North Star, MI. Visitation will be held on Friday, April 12, 2019 from 2-8 P.M. at the funeral home. Donna June was born in Emerson Township, MI on June 13, 1930, the daughter of Donald N. and Mildred I. (Showers) Cook. Donna June moved to Hamilton Township when she was 5 years old and attended the Kennett Country School. She graduated from Ashley High School with the class of 1949 as the valedictorian. She loved to play softball, basketball and was MVP of her basketball team in 1949, losing only one game. On June 18, 1950 she married her high school sweetheart Delbert Wayne Crumbaugh at Edgewood Church of God in Ithaca. They enjoyed 68 years together, traveling, attending local sporting events, and serving their community. Delbert passed away on December 10, 2018. Donna June resided all of her life in Gratiot County. She was the Secretary to the Superintendent at Ashley High School and she had various part-time jobs while her children were growing up. She was a member of the Michigan Livestock Exchange, Past President of Michigan Cattle Woman's Association, Gratiot County Board of Canvassers, Carson City Hospital Auxiliary, and Gratiot County Extension Council. She was a 4-H club leader and PTA President. She was also a member of the Ashley United Methodist Church and active in the United Methodist Women. Donna June received the South Gratiot Citizen of the Year award in 2006. Donna June and Delbert received the Gratiot County Rural Urban Farm Family award in 1984. They were also Grand Marshalls in the Ashley Trading Days and Homecoming Parades. Donna June was a master collector of Norman Rockwell memorabilia, Longaberger Baskets, antiques, puddingstones and so much more. She took pride in decoupaging graduation and wedding plaques for family, friends and her community. She blessed many with her beautiful voice in the church choir and at many weddings. Donna June painted, played organ, accordion, and was widely known for her baked beans, strawberry jam and baked goods. She was a wonderful cook for the farm hands. Donna June was a loyal MSU Spartan Fan and was very competitive in merciless games of Skip-Bo, Euchre, Old Maid, and Spoons especially with her grandchildren and great grandchildren. She is survived by her children: Michael Ray and Carolyn Crumbaugh of Stanton, Mark Alan and Brenda Crumbaugh of Ashley, Scott Wayne and Amy Crumbaugh of Ithaca, LuAnn and Kim Diffin of Ashley, Wade Aaron and Heather Crumbaugh of Fort Mill, SC; 13 grandchildren, 21 great-grandchildren, 9 step-grandchildren, brother Donald Dennis and Janet Cook of Ashley, brother in law Gerald and Francine Crumbaugh of Pine Hurst, NC, sister in law Marilyn Crumbaugh of Ashley, sister in law Suzi and Dennis Boyle of Rockville, MD and special niece and nephew Ashley and Kevin Boyle of Rockville, MD. She is also survived by many nieces and nephews. She was preceded in death by her parents, husband Delbert, and brother in law Richard Crumbaugh. In lieu of flowers, memorials may be made to Ashley United Methodist Church or American Cancer Society. Online condolences can be sent to www.smithfamilyfuneralhomes.com. The family is being served by Smith Family Funeral Homes, Ithaca, MI.